For all of Matthew chapter 12, Jesus has been in a conflict with the Pharisees. First, He healed someone on the Sabbath, which they thought was criminal. But Jesus said that He could heal on the Sabbath because He is greater than the Sabbath. He is Lord of the Sabbath. He is the King of Rest. And then He went and healed someone who was blind and mute and demon-possessed. And the Pharisees said that He could only do that because He was in league with Satan. “It is only by Beelzebub, the prince of demons, that this fellow drives out demons.” Which is just about the most evil thing you could say. Jesus basically said that it was unforgivably evil to say, if that was their true position to take. And then Jesus said that it’s no wonder they said something so evil because their hearts were so evil. Because they had snake-hearts. And it’s out of the overflow of the heart that the mouth speaks. And that everyone will have to give an account for every careless word they have spoken. And that brings us right up to verse 38. What do think the Pharisees and the teachers of the Law are going to say next? What do you think Matthew will report to us that came out of the overflow of their hearts next? No, I’m afraid it was not repentance at all. Instead, it was a demand for further evidence. And by the way, you and I don’t demand anything from Jesus. So that’s what I want to make the title of today’s message. Jesus uses some pretty strong words here. He doesn’t hold back. He doesn’t mince words. He tells it like it is. And what we need to hear, as well. This morning, I have picked out 3 key words to center our focus on this passage. And the first word is the main thing that this wicked generation was UNWILLING to do. But this wicked generation would have none of it. Instead, they asked for more proof. Let’s read Matthew chapter 12, verse 38. Now if that was all that we had ever heard about these folks, it might be okay. In general, it’s not a sin to ask God for a sign. It is a sin to demand a sign from God! And that’s basically what they were doing. “Get up here and dance! This is not a request. This is a rejection. I mean, what more do they need? What has this chapter been so far? He just did some miracles! Jesus healed a man on the Sabbath. Jesus healed a demon-possessed mute and blind man. Remember all of the miracles of authority in chapters 8 and 9 and 10 and 11? Remember what Jesus told John the Baptist’s disciples, “See what I’m doing? !” “The blind receive sight, the lame walk, those who have leprosy are cured, the deaf hear, the dead are raised, and the good news is preached to the poor. Blessed is the man who does not fall away on account of me!” (11:4-6). Jesus knows that this is not a request. This is a rejection. Nothing will convince these guys because they don’t want to be convinced. So here’s how Jesus responds. Verse 39. Now when Jesus says that this generation is “adulterous,” I don’t think he means that these people were especially given to extramarital affairs. He’s talking about spiritual adultery, right? Being unfaithful, not to your spouse, but to your Lord. That’s a theme that runs through the whole Old Testament, doesn’t it? Hosea and Jeremiah and Ezekiel especially talk about that concept. The Lord should be our first love above all others. But idolatry is being unfaithful to Him and putting something else in His place. 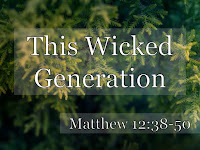 And Jesus says that this generation, this cohort of contemporaries, is wicked and spiritually adulterous. And you can know it by their demanding of a sign. A miraculous sign. A heaven-sent proof. After everything that they have been given–and on top of it all–they want a sign. That’s what Jesus is doing right here, right now. “This is the only miracle that I will do on demand. Remember Jonah from the Old Testament? He was a very reluctant prophet. Didn’t want to preach repentance to the Ninevites because he knew that the Lord was gracious, and he didn’t want his enemies to be forgiven. But the Lord did want Jonah to preach repentance to the Ninevites, and He sent a giant fish to make sure he got there! Everybody thought that Jonah was dead! He got tossed overboard, into the sea! Nobody lives from that! And then it spit him up onto dry ground. And he went and preached to Nineveh. I wonder what he looked like! After being in fishguts for 3 days. I wonder what the Ninevites thought when they saw him and heard him? Earlier this chapter, He said that He was greater than King David. That He was greater than the priesthood. That He was greater than the temple. And that He was even greater than the Fourth Commandment. Now, He adds to the list. He is also greater than the Prophet Jonah. Jonah didn’t really die. He just got swallowed up by a fish. Jesus is going to really die and on the third day rise again! Do you remember the “Queen of the South?” The Queen of Sheba? We learned about her back in the Books of Kings. 1 Kings chapter 10. She was probably from modern day Yemen at the southern tip of the Arabian Peninsula. And He’s talking about Himself. Everybody knew that. What a rebuke this is. Do you get the rebuke here? The principle is that the more you know about Jesus the more accountable you are. The more you know about the Lord the more you are accountable for what you know. Where the men of Nineveh Jewish? Was the Queen of the South Jewish? Was she a Pharisee? Was she a teacher of the Law? How much more should the Pharisees be able to recognize their messiah than the men of Nineveh and the Queen of Sheba? The more you know about Jesus, the more important it is to act on it. And these people had Jesus right there in front of them. Jesus says that the men of Nineveh and the Queen of the South will give testimony against this wicked generation at the judgment. Because they knew less about the Lord and they still repented. You are accountable for what you know. You need to act on it. Repent of any and all spiritual adultery. Repent of any and all wickedness. And that includes, especially, the wickedness of religiosity! Remember! When Jesus calls these people wicked. It’s not because they were selling drugs or molesting children or trafficking women. They were the most religious people in the land. But they were rejecting Jesus. And they were putting all kinds of things in His place. Of what do you need to repent today? Where are you working at repentance? What areas of your life are in danger of taking the place of the Lord and need to be ruthlessly rooted out? Have you repented in the first place and trusted Jesus as your Savior? Because that’s the first and most important place to turn around. In verses 43-45, Jesus tells a parable. It’s a really strange one. At first, it seems like He’s teaching us how things work in the demonic world. And secondarily, He might be. But His main reason for telling this story is the punch line about this wicked generation in verse 45. So this chapter has been all about exorcism and who is the prince of demons and who is Jesus. So Jesus uses an exorcism as an illustration. He says that suppose somebody does an exorcism and the evil spirit has wander in the desert in the while and can’t find a place to rest, and then comes back to the original host person and finds that the person is still EMPTY. He hasn’t filled up the house of his heart with a new occupant. So the spirit calls his seven bad buddies and they turn the place into a demonic frat house. Look at the punchline again. He’s saying that King Jesus has come and is cleaning house. The demons are getting booted left, right, and center. The strong man stands no chance against Jesus the home invader. But this wicked generation isn’t inviting Jesus in. Jesus is cleaning house around here, but this wicked generation is rejecting Him. And the final condition of those who reject Him is worse than the first. But it’s more than just prepare the room. It’s receive Jesus right on in to the room. So that the Holy Spirit Himself takes up residency in your heart. That’s the opposite of what this wicked generation was doing. And they were going to pay for it. First in the destruction of Jerusalem in 70AD and then in the eternal judgment. Because if you reject Jesus, there is no hope for you. “...to all who received him, to those who believed in his name, he gave the right to become children of God” (John 1:12). How do you know that you have truly received Him? Matthew tells one more story before the chapter ends. It’s a little surprising, too. Look at verse 46. Now, Jesus doesn’t really disown his biological family. Notice that He has brothers. I think that answers the question of whether or not Mary stayed a virgin all of her life. But Jesus doesn’t really disown Mary or his brothers. We know that He loved her and arranged for someone to take care of her when He was going away. But Jesus is making a profound point that spirit is thicker blood. Jesus’ real family are those who are His disciples. And, praise the Lord, it looks like some, maybe all, of his biological family was also part of His spiritual family. Mary, of course. And James, too, right? But what Jesus is saying is that you know you belong to His family if you follow the will of His Father. If you are His disciple. If you do what He has set out for you to do. If you accept His invitation. Jesus said, “Come to me, all you who are weary and burdened, and I will give you rest. Take my yoke [of discipleship] upon you and learn from me [same root word for disciple], for I am gentle and humble in heart, and you will find rest for your souls. For my yoke is easy and my burden is light” (Matthew 11:28-30). That’s how you join Jesus’ real family. Are you doing the will of Jesus’ Father in heaven? Do you know what He wants from you and are you carrying it out? This wicked generation would not follow. They would not repent even though the Messiah was standing right in front of them. 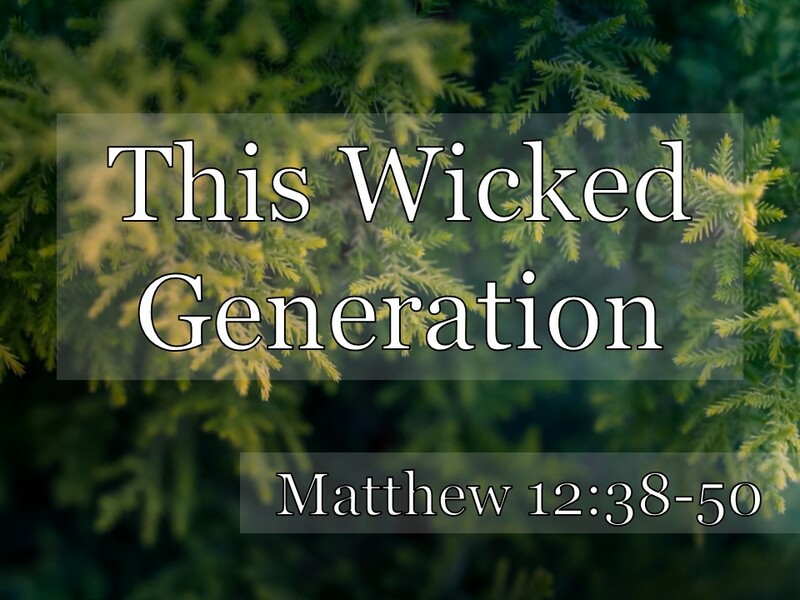 This wicked generation would not receive Jesus as their Messiah. And they were in big trouble. And there were probably many who thought they were on the fence about Jesus. Maybe at this point Mary and Jesus’ brothers were undecided. But we know that there really is no fence. With Jesus or against Him. Following Jesus or resisting Him. Don’t be like this wicked generation that Jesus confronted.